A Little Freckle. 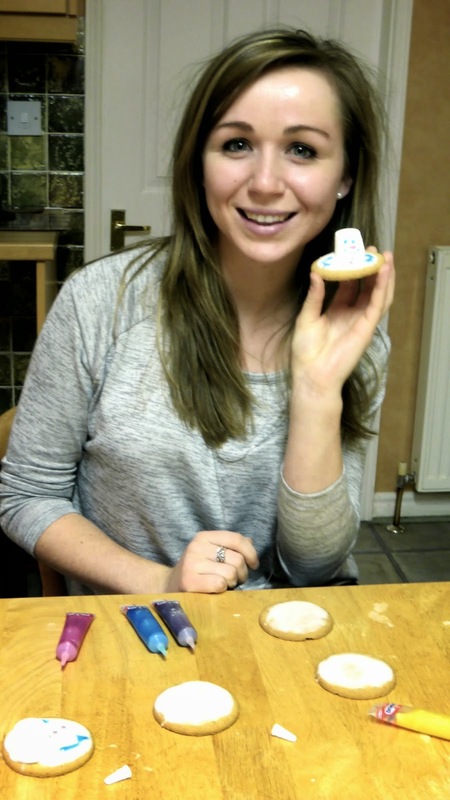 : Melting Snowman Biscuits! After watching Zoella's Quick and Easy DIY Christmas Treats video, I decided to try and make my own melting snowman biscuits! I had fun accessorising some of mine with fondant icing hats and scarves! - Fondant Icing (optional) or any other decorative bits you have! First of all, add water to your icing sugar until it's a nice consistency - not too runny or your snowmen will be melting all down the table! Spread the icing onto your digestive biscuit and then grab a white marshmallow (I just ate all the pinks ones) and plonk it on top of the icing before it dries. Leave them to dry a little, maybe 5-10 minutes and brace yourself for the fun part! There's not really a right or wrong way of decorating your snowmen. Be creative and experiment with different expressions and colours!! Half way through I decided to make little hats and scarves with some fondant icing that was leftover from the Christmas Cake! These biscuits are perfect to quickly make before your friends come over! My friend is actually on her way over now! Remember to serve with tea and enjoy!! Aren't they just the cutest?!! These are just too cute! I really wanted to make them after watching Zoella's video but haven't had the chance yet. This is making me so hungry too, haha! 300 Followers Cake Celebration and giveaway! share the love and pop me in your sidebar :)! !